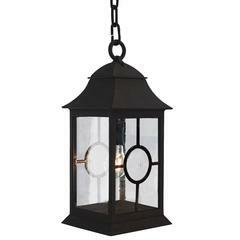 A classic form, with riveted, caged frame, graceful sloped hood, and footed base. At home in an array of settings, from beach house to mountain chalet. Max Wattage: 60, 1 standard socket. 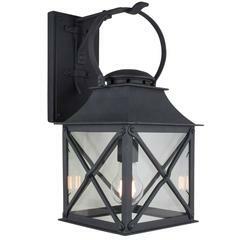 Lantern shown in Grey finish (Image #4) with German new antique glass (Image #5). 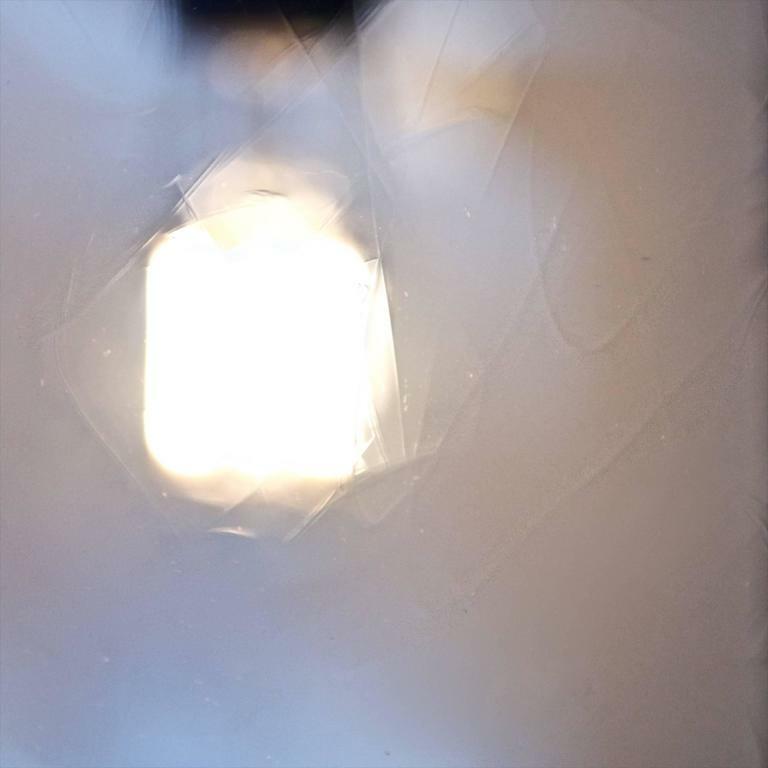 [Finish/Glass Samples are available. Please contact us to request.] Backplate dimensions (inches): 5"; W x 9" H. Hand-forged in heavy gauge wrought iron. ETL listed. 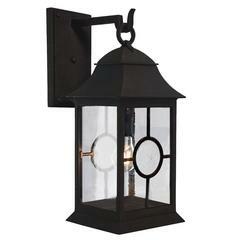 All lights ship with 5w LED Edison Dimmable Filament Bulb. 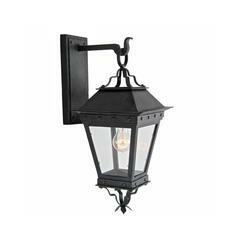 Lead time will increase to 8-9 weeks if more than ten lights are ordered. Available Finish and Glass Options* Finish: DLG Grey, DLG Brown, DLG Black Premium Finish: DLG Dark Bronze, DLG Dark Zinc, DLG Old World Glass: DLG Clear Premium Glass: DLG Antique, DLG Etched, DLG Iced, DLG Seeded *Premium Finish and Glass prices vary, please message for customized pricing. 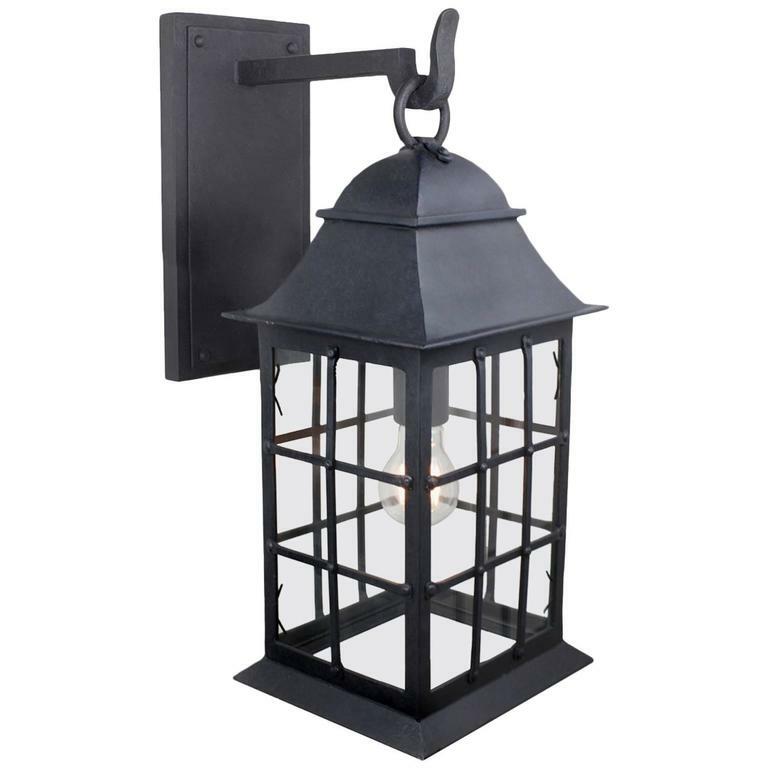 DLG Lighting Co. has created an exquisite line of exterior wrought iron light fixtures perfect for both commercial and residential applications, including outdoor wall sconces, flush mounts and pendants. With a unique approach and historical deference, the collection imbibes ageless style with a refreshing perspective. 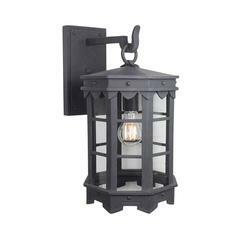 Classic metal work combined with unique detailing, heavy gauge iron and meticulous American craftsmanship ensures both a quality and timeless product. 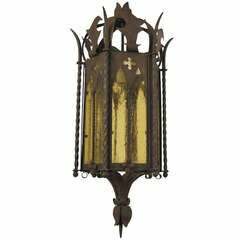 Authentic designs suit projects of varied styles, from Spanish Colonial, and Italian Mediterranean to Rustic Gothic, French Tudor and Arts and Crafts, and Contemporary. 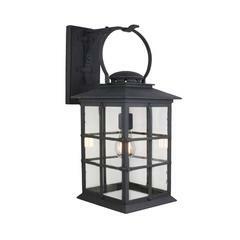 As a high-end real estate developer, Founder Jimmy Rickard, was inspired to create a carefully curated collection of custom quality, impeccably designed exterior wrought iron lanterns. 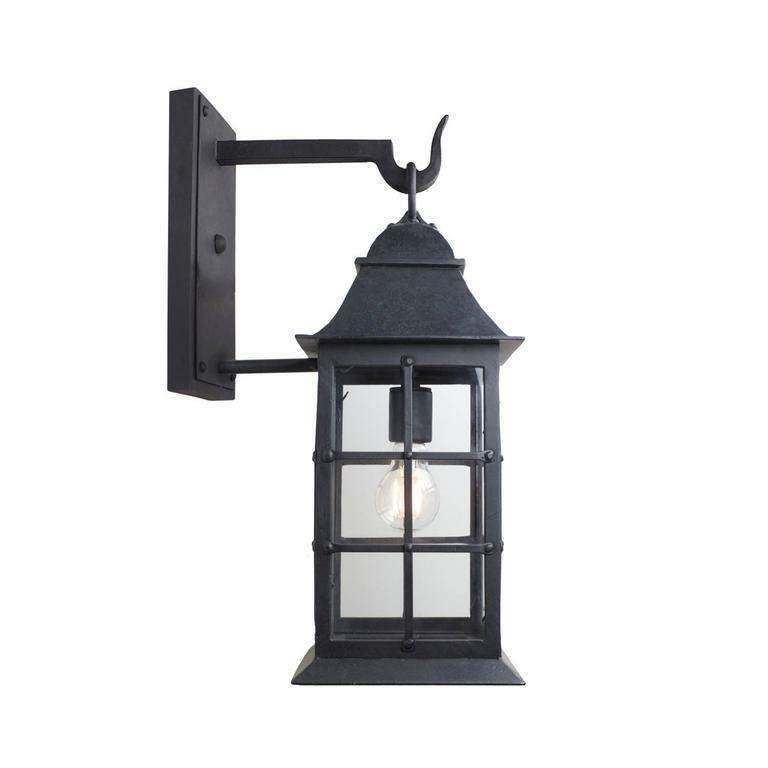 Through weekly collaborative design sessions with local architect Britt Jewett, DLG’s polished line of one-of-a-kind outdoor light fixtures was born. Their approach to design is led by the nature of the material and the history of the craft. 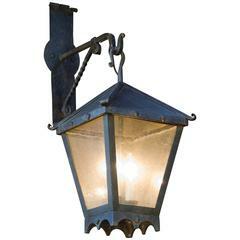 These traditional details are what DLG has become known for and intuitively convey a handmade character to our designs. 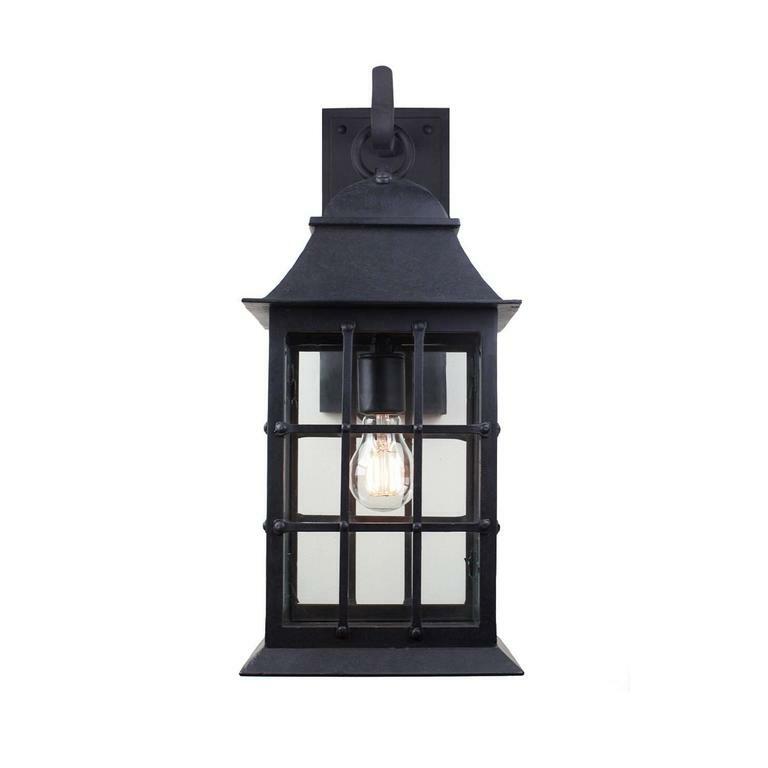 DLG uses only the highest grade, heavy-gauge metal, local artisans crafting each light by hand, and high quality finishes to extend the life of our product, applied by hand. Spec Sheets and CAD Drawings are available for every fixture, and GU-24 sockets can be used when Title 24 compliance is applicable. 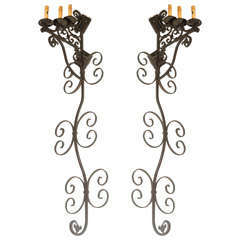 Britt Jewett, DLG Lighting Co.
Set of three very large Moorish Spanish style wrought iron wall sconces with three candle lights. 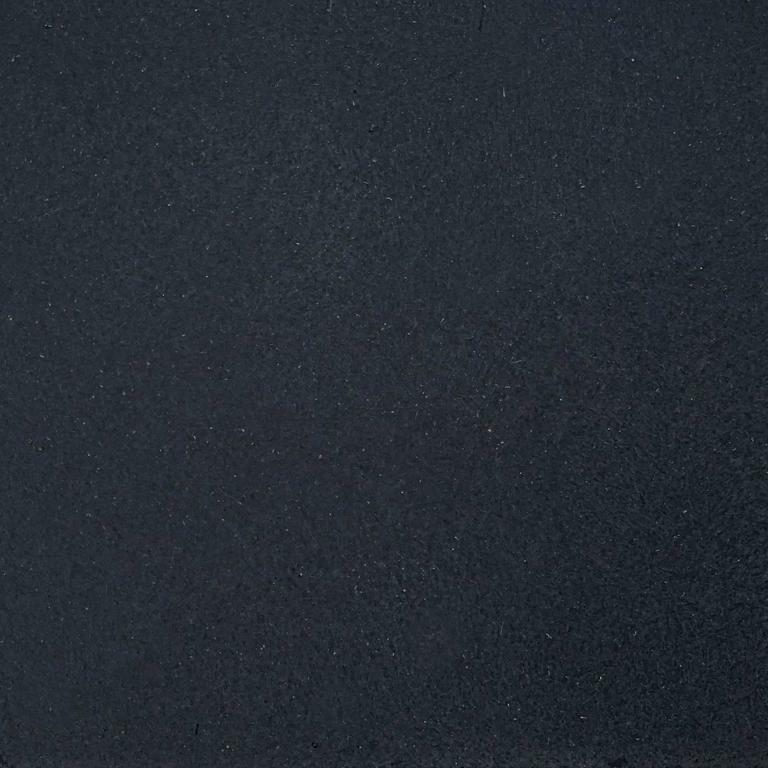 Iron is black finish. Wired for electricity ready to install. 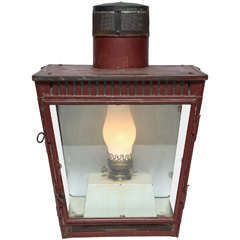 Tin wall lantern, UK, circa 1910.